I mentioned in a previous post about the awesomeness of Kathy Kinney and Cindy Ratzlaff. 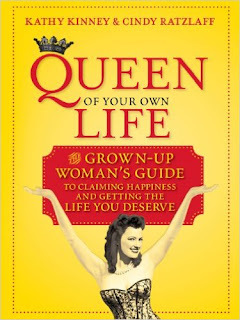 I downloaded their book, Queen of Your Own Life, and have been really enjoying it. It's pretty light reading, and it's full of great anecdotes. I like that the self-help perspective includes their real world examples - it reads more like a chat with your closest friends, rather than a lecture. A theme throughout the book is the conscious decision to choose what to leave behind and what to take forward. Leave behind the bad, the sad, and other wearying baggage and take forward what you decide you want to keep in your life. They recommend assembling a court of ladies in waiting, or a term they use I like better - non agenda friends - to help you and back you up. Weirdly this same theme cropped up in a book I am reading for my book club, Orphan Train. Although I attend regularly - it's good food, wine and non-work, non-kid centered conversation - I have a very poor record of finishing book club books. But this month I was determined, and was immediately hooked on the audio book. IT WAS AMAZING! The story flips between present day Maine and the 1930s Midwest. 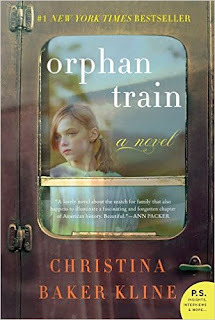 Orphan trains were real - it was a supervised welfare program that transported orphaned and homeless children from crowded Eastern cities to foster homes in the rural Midwest from the mid-1800s to the 1920s. In the book the teenager in present day has to do a project for History on the philosophy of portage. Indians in Maine used canoes for transportation, and needed to carry, or portage, their vessels between bodies of water, carrying in their canoes all of their possessions. Thus they had to decide what was worth carrying, and what needed to be left behind. Isn't that similarity weird? I won't give away where this project leads in the book - go read it!